Rejection can be defined as the act of pushing someone or something away. One may experience rejection from one's family of origin, a friend, or a romantic partner, and the resulting emotions can often be painful. Rejection can be experienced on a large scale or in small ways in everyday life. While rejection is typically a part of life, some types of rejection may be more difficult to cope with than others. A therapist or other mental health professional may be able to help an individual work through and cope with rejection and the distress that can result. Rejection can occur in a variety of circumstances. Typically, rejection describes an instance of a person or entity pushing something or someone away or out. A person may reject, or refuse to accept, a gift, for example. In the field of mental health care, rejection most frequently refers to the feelings of shame, sadness, or grief people feel when they are not accepted by others. A person might feel rejected after a significant other ends a relationship. A child who has few or no friends may feel rejected by peers. An individual who was given up for adoption may also experience feelings of rejection. Rejection can also result from life events not involving relationships, such as being turned down for a desired position at work or receiving a rejection letter from a college. While any rejection can be painful, some instances of rejection may be more impactful than others. Because most humans desire social contact, and many people crave acceptance from society, being rejected can incite negative feelings and emotions. The feeling of rejection is believed to have developed as an evolutionary tool to alert early humans who were at risk of being ostracized from the tribe they belonged to. A painful rejection from others in the tribe was likely to encourage an individual to modify any problematic behavior in order to avoid further rejection, or ostracism, from the tribe. Those who were able to avoid further rejection were more likely to survive, while those who did not find rejection to be particularly painful may not have corrected the offending behavior, making them less likely to survive. In this way, humans may have evolved to experience rejection as painful. Today, many people isolate themselves or hold back from connecting to others because they’re afraid of being rejected. Fear of or sensitivity to rejection that causes someone to pull away from others can lead to chronic feelings of loneliness and depression. While rejection sensitivity can co-occur with many mental health issues including social anxiety, avoidant personality, and borderline personality, it is not an official diagnosis. Rejection sensitivity is common in many people with attention-deficit hyperactivity disorder (ADHD). Fear of rejection may occur so regularly in individuals with ADHD that some refer to it as rejection sensitive dysphoria. Some common signs of rejection sensitive dysphoria in those with ADHD include self-criticism, anxiety in social situations, and extreme sadness after a perceived rejection. Rejection can be extremely painful because it may have the effect of making people feel as if they are not wanted, valued, or accepted. Most individuals will experience rejection at some point in their lives. A child may feel rejected temporarily by a busy parent, or a student may feel rejected by a professor who is brusque or rude. These types of rejection may resolve quickly and are less likely to have long-lasting effects. Trauma: Long-term rejection or rejection that results in extreme feelings may contribute to trauma and can have serious psychological consequences. For example, children who feel consistently rejected by their parents may find it difficult to succeed at school and in relationships with their peers. Some individuals develop a chronic fear of rejection, often as a result of multiple traumatic experiences with rejection early in life. Depression: Rejection has been linked to the development of depression in teen girls; however, others who experience rejection may also become depressed. 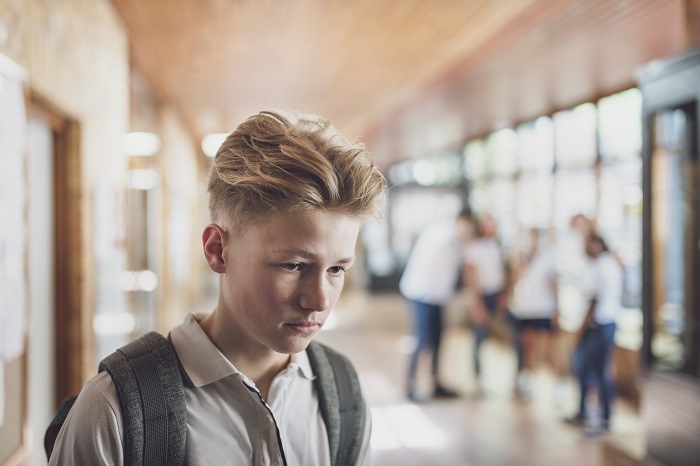 Further, bullying, which is essentially a combination of ostracism and rejection, can have numerous negative effects, including depression, stress, eating disorders, and self-harming behaviors. Pain response: Research has shown that the brain responds to social pain in a way that is similar to the way that it responds to physical pain. According to research, the same brain pathways that are activated by physical pain are also activated by social pain, or rejection. Receptor systems in the brain also release natural painkillers (opioids) when an individual experiences social pain, the same as when physical pain is experienced. Anxiety and stress: Rejection might often contribute to pre-existing conditions such as stress and anxiety or lead to their development. Similarly, these and other mental health conditions can exacerbate feelings of rejection. Abuse: One study found that, in the male members of the study, the perpetration of abuse in intimate relationships was associated with the experience of higher levels of parental rejection in childhood. Symptoms of posttraumatic stress and deficits in social information processing were also linked. While rejection can hurt, it’s never healthy to take the pain of rejection out on another person through emotional abuse or physical violence. One study found, for example, that perceived rejection may contribute to violence or aggression against that group. A compassionate therapist can help individuals who feel rejected learn to deal with perceived or real rejection and build social skills that may help them connect more easily with others. Familial rejection: Rejection from one's family of origin, typically parental rejection, may consist of abuse, abandonment, neglect, or the withholding of love and affection. This form of rejection is likely to affect an individual throughout life, and it may have serious consequences. Social rejection: This type of rejection may occur at any age and can often begin in childhood. Social rejection can include bullying and alienation in school or the workplace, but it can also extend to any social group. Those who challenge the status quo or who live what is considered “outside the norm” for their society may be more prone to social rejection. Rejection in a relationship: People may experience rejection while dating or in a relationship. For example, an individual may refuse to share an event or experience with a partner, withhold affection or intimacy, or treat a partner as if that person were no more than a casual acquaintance. When an individual decides to end a relationship, this can also cause the other partner to feel rejected. Romantic rejection: Rejection can occur when a person asks for a date and is denied. While this may also be known as sexual rejection, the person who is romantically rejected may not always be interested in a sexual relationship. All forms of rejection can hurt, and when the rejecting is done by a trusted loved one, it can deeply impact self-worth and self-confidence. While therapy can help people overcome wounds that may be caused when a person is rejected by a loved one, it can also help individuals learn to accept types of rejection that occur in day-to-day life, such as rejection by a potential romantic partner, being turned down during a job search, or while applying to college. Romantic rejection can be particularly challenging, especially to individuals who desire a lasting romantic relationship. A breakup, or rejection from a romantic partner, can lead to feelings of grief that may be overwhelming and can last for weeks, months, or even years. Rejection in a romantic relationship might alter the way one views one's life and one's own self long after the breakup has occurred. A person has developed romantic feelings for a friend over time. One attempts to date or otherwise seek intimacy with an individual who does not wish to pursue anything other than friendship. The concept of the friend zone is considered by many to be problematic. Although anyone may use the term "being friend zoned" to describe an instance of being rejected, the term is most often applied to and by men who have been turned down by women. While many individuals may be able to readily accept that the person they are attracted to does not have the same feelings, others may feel disgruntled or angry. Some may believe that because they have been nice to an individual, they deserve a chance to date and win the affection of that person. Some may also believe that remaining friends with a person one is sexually attracted to will give that person the chance to realize romantic feelings toward the other individual and develop the desire to pursue a romantic relationship with them. These ideas can perpetuate the notions that romantic love is superior to friendship, that individuals (typically men and women) cannot remain friends without desiring sexual contact, and that all individuals desire sexual contact (eliminating the experiences of those who are aromantic or aseuxal). This concept is not always used in reference to a man and a woman. When it is used in such a manner, it can have the effect of furthering the belief that when a woman turns a man down, she may not really mean it or may give a different answer in the future, thus implying that women, or any individual who rejects another, cannot be responsible for their own attractions or dating preferences and may not know what they want. The "friend zone" can also be said to contribute to heterosexist beliefs, as another basis for the concept is the assumption that individuals are heterosexual unless they state otherwise, or that heterosexuality is the "normal" sexual orientation. Using the term friend zone is not necessarily harmful. A person who jokingly states, "I was put in the friend zone again," may be able to accept this and move on easily. However, the concept is considered by many to be grounded in ideas that can be harmful. Thus, it may be helpful to find a different way to describe a situation where one has been rejected, and those who experience difficulty coping with rejection may find help and support in therapy.